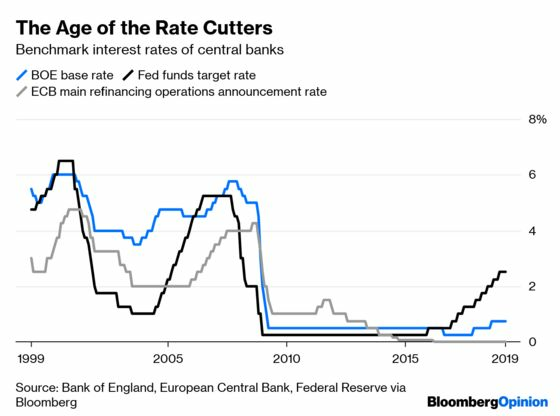 (Bloomberg Opinion) -- Economists tend to think of central-bank interest rates purely in terms of their effect on macroeconomic benchmarks such as inflation, output and unemployment. The Federal Reserve’s dual mandate, for instance, directs it to seek stable prices and maximum employment. Mainstream macroeconomic models, such as the dominant New Keynesian models used by most central banks, support this view. Occasionally, economists or financial commentators will add asset prices to the list, warning that low rates will cause financial instability or calling for the Fed to cut rates to boost the stock market. In contrast, very few economists think about central-bank interest rates in terms of their long-term impact on growth. Typically, growth is thought to result from factors outside the central bank’s control -- the march of technology, government regulation, taxes or other structural factors. That leads to a neat separation of responsibilities: the Fed handles macroeconomics, while Congress handles the micro. 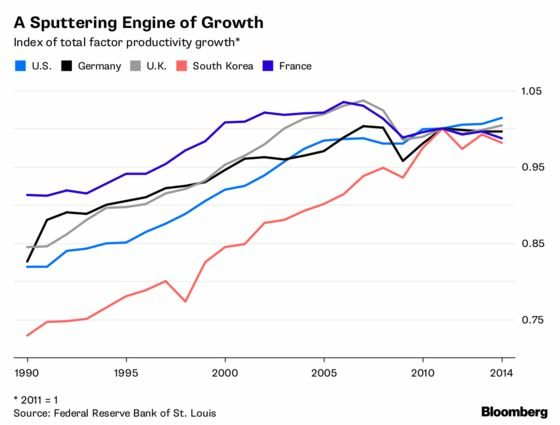 But it’s possible that this division of labor is fundamentally mistaken, and that interest rates can have a substantial and direct -- and not always positive -- effect on long-term productivity growth. One possible way this could happen is if low rates encourage monopolies. That’s the conclusion of a new paper by economists Ernest Liu, Atif Mian and Amir Sufi. According to their theory, top companies are better able to take advantage of low rates than their lagging rivals, since the payoff to borrowing is greater. Big companies taking over the market could limit productivity, because even if these companies’ operations are more productive, they can choke off markets to increase their profits. Liu et al. note that market concentration has been rising even as interest rates have fallen. But an even more direct way that cheap credit could reduce productivity growth is by keeping unproductive companies from going bankrupt. One way that low rates are supposed to juice economic growth is by making it profitable for companies to borrow even when the payoff to borrowing isn’t high. But if rates stay low for years or decades, these companies can just keep on borrowing to stay afloat. They could become so-called zombies -- unproductive companies that keep sucking up resources better used elsewhere. The classic case of zombies was in 1990s Japan. An influential paper by economists Ricardo Caballero, Takeo Hoshi and Anil Kashyap documents and analyzes this phenomenon. 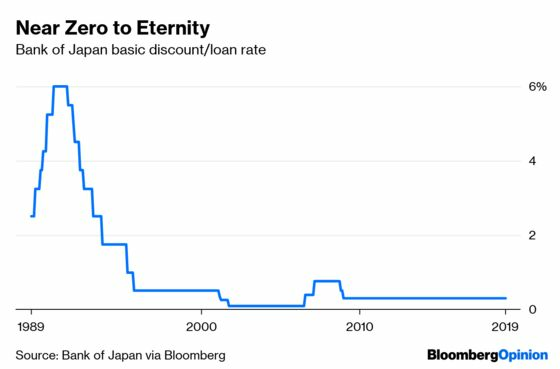 Large Japanese banks allowed unprofitable companies to roll over their maturing loans at relatively low interest rates indefinitely. This not only created competition for healthier companies and forced them to charge lower prices that hurt their profit margins, it also sucked up workers and capital that healthier companies could have used to grow. Other papers tell a similar story. Economists are beginning to warn of a plague of undead corporations in other countries. Dan Andrews and Filippos Petroulakis have a paper citing a rise in bank-supported zombies in 11 European countries, using language eerily similar to that used to describe Japan more than a decade ago. Ryan Banerjee and Boris Hoffman of the Bank for International Settlements examine 14 countries, including the U.S., and declare that zombification has risen even when conservative definitions are used. They also show that low interest rates tend to precede an increase in the number of zombies. Meanwhile, a very interesting new paper by economists Philippe Aghion, Antonin Bergeaud, Gilbert Cette, Remy Lecat and Helene Maghin looks at the relationship between credit constraints and productivity at the level of industrial sectors and individual companies, using French data. They find a U-shaped relationship at the sectoral level -- at first, more lending is correlated with rising productivity, but as credit becomes very loose, productivity tends to fall. Unproductive companies with easy access to credit tend not to exit the market -- a clear mechanism by which low rates might create zombies. Ultimately, this will mean smaller increases in living standards for citizens of these countries, as well as stunted markets for the exports of developing countries. Could zombie companies be the link between the decline in interest rates and the slowdown in productivity growth? It’s not yet clear, but central banks should look into the possibility. And people should be cautious about embracing alternative economic theories that advocate setting rates permanently at very low levels. If low rates have effects beyond the traditional macroeconomics of inflation, employment and growth, it could change our entire understanding of what central banks -- and macroeconomic policy in general -- should try to accomplish.